START YOUR SUMMER JOB SEARCH WITH SHAWNEE COUNTY PARKS + RECREATION. 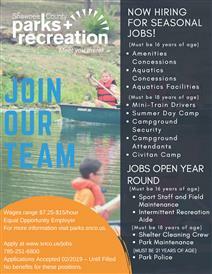 SCP+R IS LOOKING FOR MOTIVATED AND RELIABLE INDIVIDUALS TO FILL NUMEROUS SEASONAL POSITIONS IN AQUATICS, SPORTS, PARK MAINTENACE, SUMMER CAMP, CONCESSIONS AND MORE! HIRING SUPERVISORS WILL BE ON HAND TO ANSWER QUESTIONS & COMPUTERS WILL BE AVAILABLE TO COMPLETE APPLICATIONS. DATES ARE SET WHEN SCHOOL IS NOT IN SESSION TO ALLOW STUDENTS TO ATTEND. Wages range $7.25-$15/hour Equal Opportunity Employer For more information visit parks.snco.us.